Mafia godfather Sam Giancana was frying sausages in his Chicago basement on a hot June night when a friend called. Seconds later he lay dead, shot seven times in the head. It looked like a mob it, but Sam’s brother knew better. The godfather had been due to give evidence to a senate committee, and his testimony was feared by on of America’s most powerful organizations, the CIA. With Sam dead, the agency reasoned that the truth would never come out about the Mafia’s lucrative partnership with the CIA in the United States, Cuba, the Middle East, the Vatican and South-East Asia. However, Sam had talked, sharing his darkest secrets with his younger brother, Chuck. Double Cross is the result, a chilling tale of corruption and treachery in high places. It reveals a web of intrigue which linked mobsters to the CIA. In exchange for help in Cuba, for example, the CIA allowed over 100 million dollars a year in illicit drugs to enter the USA, and took ten percent of the profits. The most startling disclosures concern President Kennedy and Marilyn Monroe, both apparently murdered by the Mafia with CIA assistance. Giancana started out as a hit man for Al Capone. He grew into a ruthless and clever murderer with limitless ambition. When old Joe Kennedy gave him a chance to use the mob muscle in support of his son Jack, Sam leapt at the chance. Sam vowed to destroy him. He had evidence of the president’s numerous amorous adventures, including an affair with Marilyn Monroe, but feared that a blackmail attempt would expose the CIA’s ties to the mob. Sam had Marilyn murdered, hoping to implicate the Kennedys, but the FBI covered up the evidence. The result was the plot to assassinate the president. With Sam’s widespread connections it was all too easy. The CIA supported the plan, and finance was provided by wealth Texans. Others involved were the mayor of Dallas, whose brother was a CIA official, and the city police. 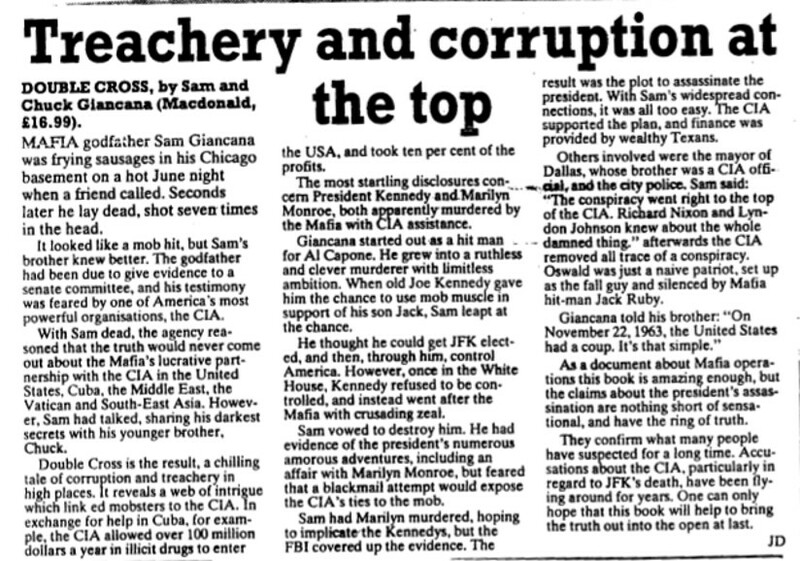 Sam said: “The conspiracy went right up to the top of the CIA. Richard Nixon and Lyndon Johnson knew about the whole damn thing.” Afterwards the CIA removed all trace of a conspiracy. Oswald was just a naïve patriot, set up as the fall guy and silenced by Mafia hitman Jack Ruby. As a document about Mafia operations this book is amazing enough, but the claims about the president’s assassination are nothing short of sensational, and have the ring of truth. They confirm what many people have suspected for a long time. Accusations about the CIA, particularly in regards to JFK’s death, have been flying around for years. One can only hope that this book will help bring the truth out into the open at last.